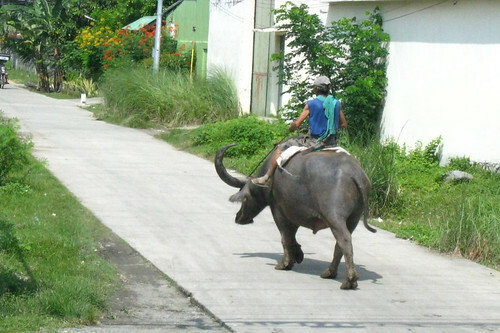 You can't go anywhere in the Philippines without running into the modern version of the workhorse, the water buffalo, the llama. I mean, of course, the jeepney. First fashioned from the jeeps left by the Americans after World War II, the jeepney is the backbone of the public transportation system. More than that, it's a cultural icon in its own right. 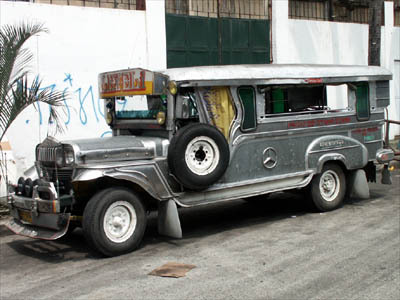 The jeepney and its driver have been the subject of articles in anthropology and sociology. One blog celebrates "the Pinoy's capacity to beat swords into ploughshares, to transform weapons of mass destruction into instruments of mass celebration: mortar shells into church bells, rifle barrels into flutes... JEEPS INTO JEEPNEYS." It's little wonder that the vehicle and its driver are equally celebrated. 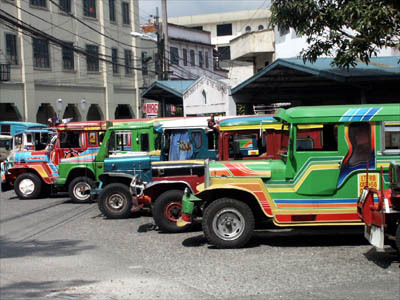 After all, the unique appearance of most jeepneys is held to be a reflection of the driver's personality. The examples I give here are tame; for many more, visit this page of Google images. And for a broader look at the jeepney's history and evolution, see the article at Wikipedia. Last summer, when I spent eight weeks living near Angeles City in Pampanga, the only way to get to and from "town" was the jeepney (taxis were prohibitively expensive). I spent many a short ride squeezed into a very small space, head down. I knew how cattle felt. Still, for about 20 cents American, I could be whisked away to the mall where my wife and I lived in off-hours. Someone said you can't know a country until you've traveled like "the people." I guess I know the Philippines now.